Home Indigenous health 5 reasons to endorse the Uluru Statement from the Heart, on health grounds alone. 5 reasons to endorse the Uluru Statement from the Heart, on health grounds alone. Croakey is urging the Joint Select Committee on Constitutional Recognition to recommend that the Australian Government acts now to accept the recommendations of the Uluru Statement from the Heart. In a formal submission, published below, the Croakey team of journalists, editors and contributing editors argues that enactment of the reforms of the Uluru Statement from the Heart “is the best, most equitable and healthiest way forward for all Australians”. The Joint Select Committee, co-chaired by Western Australian Labor Senator Patrick Dodson and Liberal MP Julian Leeser was set up following the abrupt rejection by Prime Minister Malcolm Turnbull of the landmark Uluru Statement from the Heart. The Committee has recently conducted hearings at Barunga, Halls Creek, Fitzroy Crossing, Kununurra and Broome and will hold further public hearings in Dubbo (2 July 2018 Sydney (3-4 July), Adelaide (5 July 2018) and Perth (6 July). The Australian Medical Association recently endorsed the Uluru Statement and plans to lodge a submission to Committee later this week. Croakey urges other medical and health organisations to also make submissions in support of the Uluru Statement. You can follow the instructions for lodging submissions here. 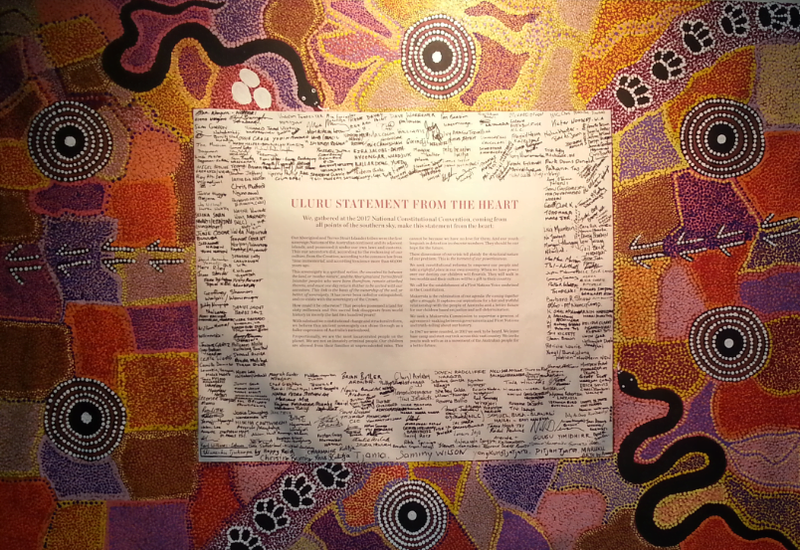 We are writing on behalf of the Croakey team*, to add our collective voice to those endorsing the three important reforms outlined in the Uluru Statement from the Heart: Voice, Treaty, Truth. Croakey is an Australian social journalism project that connects health and social service professionals, academics, community members, policy makers and others, with the aim of improving health and health equity. We recognise that the health of individuals is connected to the health of communities, societies and the planet. Much of what influences health is socially determined – a person’s social and economic environment, physical environment, access to health services, and structural and societal factors. Achieving optimal health and health equity for all Australians will not be possible without addressing these factors. Paying attention to the social determinants of health is particularly important if we are to close the health and life expectancy gap between Indigenous and non-Indigenous Australians. In particular, racism, social exclusion, disempowerment and intergenerational trauma have been identified as important factors that need to be addressed before we will see real improvements in the lives and health of Aboriginal and Torres Strait Islander people. We argue from this perspective below, that enactment of the reforms of the Uluru Statement from the Heart is the best, most equitable and healthiest way forward for all Australians. We ask the Joint Select Committee on Constitutional Recognition to recommend that the Australian government act now to accept the recommendations of the Uluru Statement by enshrining in our constitution a First Nations’ voice to parliament, and supporting the establishment of a Makarrata Commission to oversee agreement-making with government, and truth-telling about our history. In their recent submission to the Joint Select Committee on Constitutional Recognition, which the Croakey team wholeheartedly endorses, the National Health Leadership Forum has explained succinctly how the lack of constitutional recognition of Australia’s First Peoples has been, and continues to be, a stumbling block to equity and health, enabling laws and policies that discriminate on the basis of race or simply fail to take into account their implications for Indigenous people. In the sphere of health policy, Indigenous Australians have been dubbed “legally invisible” leading to health legislation that does not sustainably meet their needs. The Constitution needs to change for this problem to be addressed and, in composing the Uluru Statement from the Heart, the Referendum Council has consulted widely and considered the options, before outlining how this should happen. Constitutional enshrinement of an Indigenous voice to parliament will both redress the problem of a lack of recognition of Aboriginal and Torres Strait Islanders in the Constitution, and fulfill the government’s stated agenda of consultation with Aboriginal and Torres Strait Islander people on matters that affect them – a commitment to do things with, not to Indigenous people. The Law Council of Australia has recently expressed its support of the voice to parliament, pointing out that a voice to parliament is not a voice in parliament, and that “there is no legal impediment to making provision for a representative body to provide Aboriginal and Torres Strait Islander First Nations a Voice to Parliament in the Constitution.” A voice to parliament will make sure that constitutional recognition is not just a token, one-time event, but that that consultation takes place, and is formalised, ongoing and respected. Enshrining the Indigenous voice to parliament is in keeping with the United Nations Declaration which asserts Indigenous Peoples’ rights to full participation in society, and self determination. In its 2008 report, Closing the gap in a generation Health equity through action on the social determinants of health, the World Health Organization recognized the need for both political and community empowerment – inclusion and voice for all groups in society. We believe that, with the enshrinement of an Indigenous voice to parliament, both these things will follow. Self-determination has been shown to improve health in Canadian populations and in New Zealand. A good example in Australia is the Aboriginal Controlled Health Organisations, which not only provide superior access and care to mainstream services but have also provided a model in influencing these services to do better. Imagine if this were reflected in other areas of Australian society. With change at the constitutional and parliamentary level, all Indigenous Australians will be living live in a more inclusive society, where they are considered and represented. If institutional racism is reduced, access to education, economic opportunities, employment and healthcare will open up. Structural change can make a real difference to individual lives. The Uluru statement calls for “Makarrata” – the coming together after a struggle. Indigenous Australians live with intergenerational and ongoing trauma, which have measurable effects on health. Stories of trauma need to be heard so that all Australians can develop a shared understanding of our history. Others have cited the international precedent for truth-telling in countries with violent colonial histories such as Canada, South Africa and New Zealand. Truth telling can be part of the healing process if it is designed to be so. It has also been pointed out that, in the ideal situation, a national treaty should precede and set a standard for state-based negotiations. The Uluru Statement was crafted in good faith by the team appointed by the Australian government after an exhaustive consultation process, with the final draft involving a delegation of 250 Indigenous leaders. Its authors, along with Indigenous leaders and peak bodies throughout Australia, have consistently said that the reforms are desirable and workable. This fact on its own is enough reason to pursue the reforms with respect and good will. They are joined by mainstream health, social service and legal organisations, including health and Indigenous health researchers, and thousands of individuals, who have signed petitions or written submissions. Our Prime Minister reportedly told members of the Referendum Council that the idea of an Indigenous voice to parliament would have a “snowflake’s chance in hell” of surviving a referendum, but the snowflake has defied scientific expectation in at least one poll, which found that 60.7% of respondents were in favour of “a change to the constitution to set up a representative body to advise the Parliament on laws and policies affecting Indigenous people”. The government’s wholesale dismissal of, and failure to respond in any meaningful way to, the Uluru Statement was disappointing and perplexing. It is with high hopes that we write to you, the Joint Select Committee on Constitutional Recognition, and ask you to give the reforms proposed in Uluru Statement from the heart the respectful and serious consideration they deserve. *Dr Ruth Armstrong, Dr Melissa Sweet, Amy Coopes, Jennifer Doggett, Summer May Finlay, Marie McInerney, Dr Louis Peachey, Dr Lesley Russell, Dr Tim Senior and Dr Megan Williams. Australia warned on the ‘chronic disease time bomb’ – but what about the underlying causes?